The Virginia Constitution of 1869, passed during Reconstruction, established a statewide system of free public schools. Despite this, public education during the nineteenth century more closely resembled its pre–Civil War predecessors than today's system. Education was decentralized and unsystematic. There were no compulsory attendance laws, no standards for teachers, no required curriculum, and no uniform length of terms. Schools in the city were very different from those in rural areas. For example, in 1888, Amherst County schools were open for an average of ninety-eight days, while schools across the James River in Lynchburg were open for 193 days. Throughout the state, but especially in rural areas, attendance was haphazard. In Buckingham County in 1889, only 51 percent of white school-aged children and 35 percent of black school-aged children were enrolled in school. Average daily attendance was even smaller—31 percent of white children and only one in five black children. This was fairly typical in rural areas. Teachers: Visit Teaching with Photographs for questions to ask your students about education. The formation of schools was largely the responsibility of parents. They would find an appropriate building (often a church) or build one. Often, they would even suggest a teacher, who would then be certified by the county superintendent and local school board. Although teacher salaries were usually paid by the county, sometimes this was the only public money used to support the school. A county might provide materials to repair a school building while parents and students provided the labor. Teachers often went for a long time without being paid. A good deal of teacher energy was directed at attracting and maintaining students. If average daily attendance fell below a certain level, usually about twenty, the local superintendent saw this as an indication of declining support and teacher salaries were cut proportionally. If the decline continued, a teacher's contract was not renewed. The usual measure of a teacher's effectiveness was his or her ability to discipline the students, especially the older boys. In one instance, the Prince William County school board balked at hiring a prospective fourteen-year-old teacher because of doubts about her ability to control students who had been her classmates the year before. 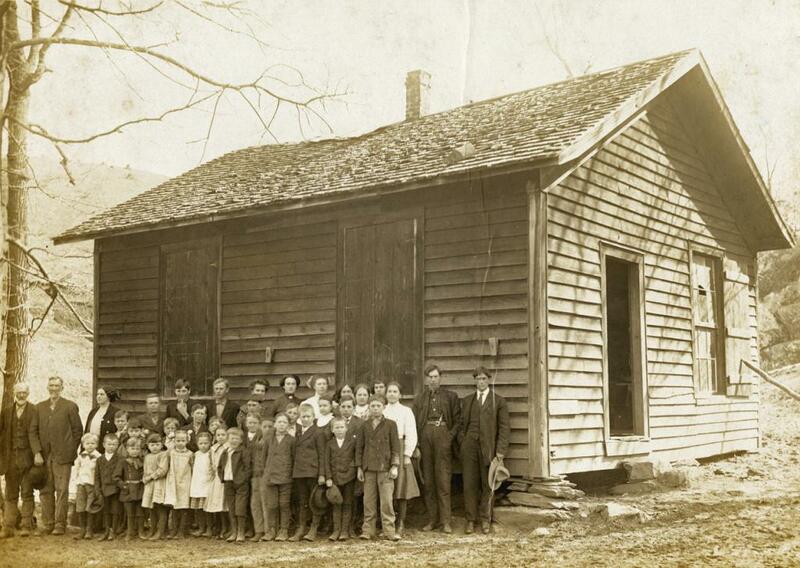 Most schools consisted of one-room made of logs or wood frame. Students, who ranged in age from five to nineteen, sat on rough uncomfortable benches. All students studied spelling, reading, handwriting, and math; more advanced students moved on to grammar and geography. Students were required to memorize and recite their lessons. Textbooks usually consisted of either The McGuffey Reader or The Holmes Reader, both of which were filled with parables that imparted lessons about thrift, hard work, self-discipline, and the superiority of rural life. Around the turn of the century the schools began to change. Reflecting reforms associated with the Progressive Movement, public schools became more centralized and uniform. Like the Progressive Movement itself, this educational reform movement emanated from the cities and was directed by a growing class of urban professionals. Schools were consolidated into larger buildings and graded. Curricula and lengths of terms were standardized. Teachers were certified and high schools established. An educational bureaucracy, centered in Richmond, started to develop. And the teaching profession became overwhelmingly female. Reflecting public opinion about the role of women, teachers who married had to leave the profession. These reforms, although initiated by Virginians, were supported and encouraged by northern philanthropists and educators. In doing so, they accepted Virginia's Jim Crow system of education. Reforms were directed toward white schools and trickled down to black schools. All schools improved; but schools for white children improved more, and the gap between black and white schools increased. 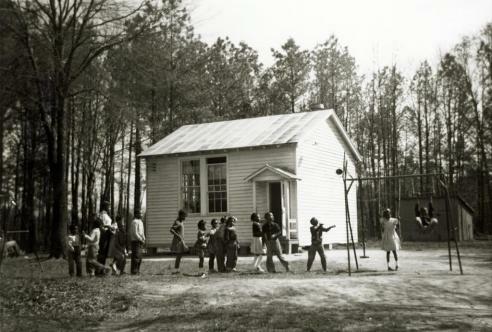 Schools remained segregated and unequal. Often transportation was provided to white schools but not to black ones. White teachers earned more money than black teachers, and male teachers were paid more than female teachers. Beginning in the 1930s, black plaintiffs filed lawsuits to break down segregation at the graduate and professional school level and to equalize facilities in public high schools and elementary schools. Public school suits often focused on teacher salaries because these disparities were the easiest to prove. Between 1940 and 1954, many cities and counties in Virginia were under court order to make separate educational facilities equal. In 1951, an equalization case arose in Prince Edward County, Virginia. Black students at Robert R. Moton High School staged a strike to protest the poor facilities at their school. They were led by Barbara Johns. At the urging of attorneys Oliver W. Hill and Spotswood Robinson, the case became an integration suit and one of five cases that comprised the Brown v. Board of Education decision in 1954. In reaction to Brown, the General Assembly, under the direction of Sen. Harry F. Byrd passed legislation closing any school under court order to integrate. This was known as "massive resistance." In 1958, public schools in Warren County and the cities of Charlottesville and Norfolk were closed. On January 19, 1959, both the Virginia State Supreme Court and the United States Supreme Court declared that Virginia's massive resistance laws were unconstitutional. Two weeks later, black students entered previously all-white schools in Norfolk and Arlington. The supervisors in Prince Edward County took massive resistance a step further by voting to end all local support for schools. Public schools in Prince Edward County were closed in September 1959 and remained closed for five years. Most white students attended the private Prince Edward Academy, while black students either traveled to schools in neighboring counties, lived with friends or family outside the area, or just remained out of school. In the early 1960s, both residential segregation and local "freedom of choice" plans limited school integration throughout the state. This ended in 1968, however, with the Supreme Court's decision in Green v. County School Board of New Kent County. The decision required school systems to show actual progress in desegregation. In many areas this meant busing to achieve a racial balance. In cities across the state, busing led to the exodus of white families to the suburbs. White flight was followed by black flight—the movement of middle-class African American families from central cities. Possum Hollow Schoolhouse, Floyd County, 1910 (VHS accession number: 2001.230.308) Photograph, Possum Hollow Schoolhouse, Floyd County, taken February 25, 1910. Image of a frame school house with students and teachers posed outside. Photograph mounted on cardboard with more information about the site on the back of the card. Public school at Big Stone Gap (VHS accession number: 2001.528.3) A black and white postcard of the public school at Big Stone Gap, Virginia. The four story structure is made of stone and is surrounded by a stone wall. There is a flag pole on the roof. There are some small structures in the background. There is no writing on the reverse. 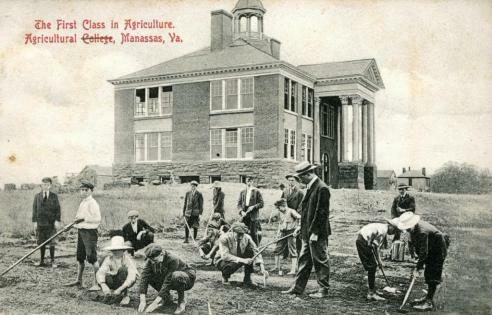 First Class in Agriculture, Agricultural College, Manassas (VHS accession number: 2001.539.1) Postcard, The First Class in Agriculture, Agricultural College, Manassas, Va. A black and white postcard of the First Class in Agriculture at the Agriculture College [High School] in Manassas, Virginia. A group of students (teenage and younger boys) and a few teachers are working a plot in a field with hoes, rakes, and their hands in the foreground. A large two-story brick and stone building with basement, cupola, and porch with columns is in the background. The postcard was published by Prince William Pharmacy, Manassas, Va. and made in Germany. Leonie Helen Holmes, Richmond, 1911 (VHS accession number: 2003.298.29.A) Photograph of Leonie Helen Holmes an African American woman graduate of Richmond Public Schools, she is standing next to a chair behind her framed diploma wearing a white dress, holding a bouquet of flowers which are tucked under her left arm and holding a paper copy of her diploma in her right hand. Hamilton High School, Cartersville, c.
Gumtree School, Hanover County, c.
Learn about how the Equal Suffrage League of Virginia helped women gain the right to vote. Learn about how one slave was granted his freedom.